BID LEICESTER Business Plan Launched ! After many months of consultation and engagement with city centre businesses the BID LEICESTER Business Plan was launched at Hotel Maiyango on Friday 15th September! The Business Plan will be sent to all businesses eligible to vote in the upcoming BID Leicester ballot, which runs from 6 October – 2 November 2017. Following extensive feedback from businesses the plan focuses on delivering a more welcoming, more accessible, safer city centre that is better promoted to drive business day and night and where the business community is actively supported. All these aspects would contribute to Leicester being increasingly recognised as a destination of choice. 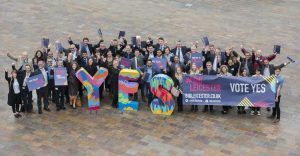 BID LEICESTER presents businesses with a real opportunity to have a say in how the city centre is run for the next five years. We hope you take the time to read the document and can see the very real benefits that could be realised with £4.2m of investment. Click on the link below to download the document (PDF).